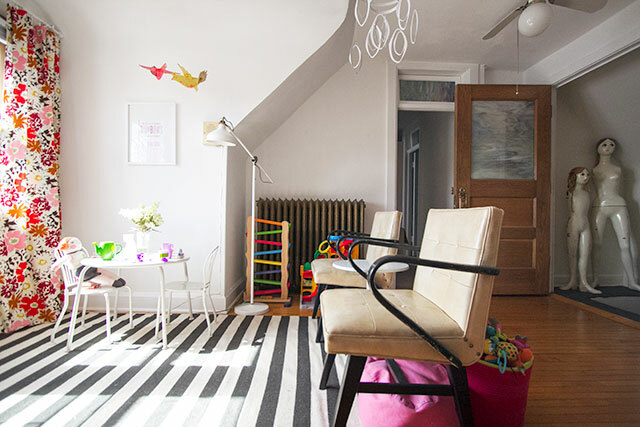 Yesterday’s post was more about how we use the space, but today I wanted to share some more photos of the playroom. It isn’t quite done, but nearly so. I have some clips for hanging the kids’ art that I want to put up, and some other prints and paintings to hang. I sewed those curtains way back when, and now that they’re up, I can take down the old blinds that are still there. The windows themselves though are the worst in the house. I’d like them to be painted white, but I suspect they’ll need repair or replacement, so I’m holding off until I assess my options. Eleanor has a lot of tea parties here. She setup this little homemade booster seat a couple of days ago, and seeing it was one of those “awwww” moments of parenting. Both she and August like to use the play kitchen a lot. As much as I like pink, I was hoping for something more gender-neutral in color, but then I found this one on clearance for a great price. It’s well-made and fun to play with, and I’m pretty sure neither kid cares what color it is. Ever wonder where those flea market mannequins of mine went? There they are! On the right. Good golly, they really are creepy, aren’t they? It’s like the latex head Brandon used to hide in our kitchen cabinets — you get so used to the weird creep-factor that you kind of forget about it until you see it through someone else’s eyes. Let’s move on. 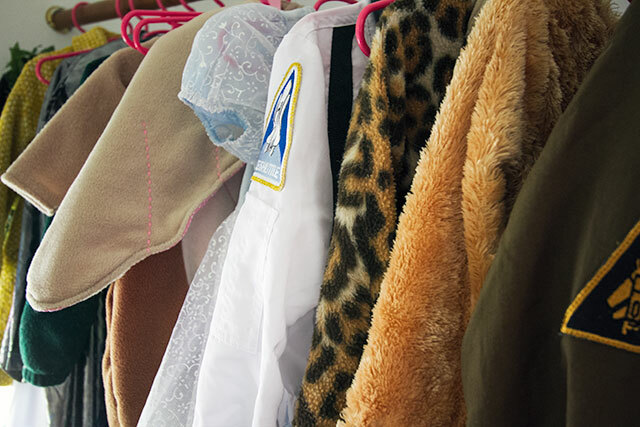 Dress-up closet! Outside the closet, I lined up the bookshelves that used to be in Eleanor’s room, in the last house. I’m planning on painting a fun pattern behind the art desk, to break up all the white, and putting up the kids’ artwork will help too. It may not be done, but it’s working so nicely for us. p.s. I love the mannequins! And the mask collection. Wow! We have toys throughout the house too, in the playroom, in their bedrooms, and elsewhere too, but it’s still nice to have a dedicated space just for the kids here. And it’s just upstairs from our bedrooms! We’re upstairs a lot more often than we were in the basement playroom we created in the last house. Wow, so tidy! My boys’ have TOO much stuff. 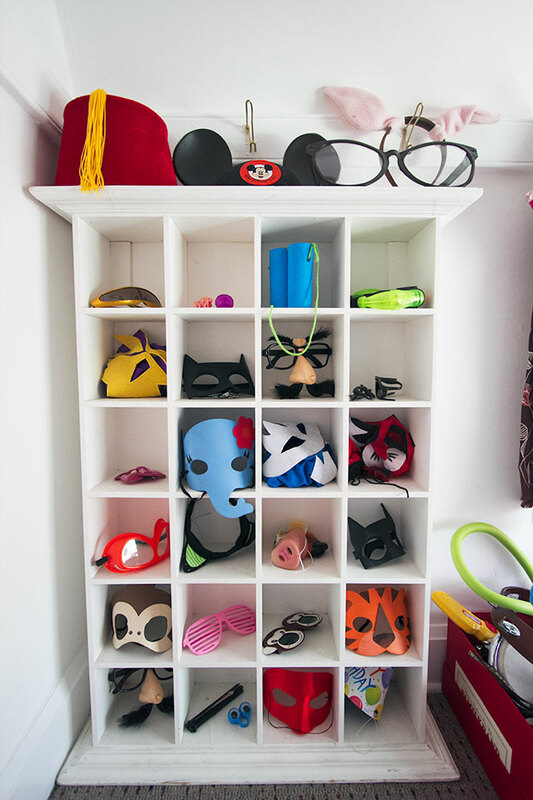 I like your storage for dress ups, I’m struggling with that, I bought a coat rack from ikea to hang them on, but it ends up in a big mess, and have nowhere for masks and helmets. I can’t get our boys’ to play upstairs alone, or go up there alone at all, lol, do your children need an adult to accompany them too? I just had a brainwave, re costume storage, I have a small alcove on the landing where I can put an extending wardrobe rail, that will be much tidier! I saw your space, that you shared on my FB page. It looks fantastic! We do tend to stay up there and play with them, though Eleanor at nearly five will go up and play by herself sometimes. August is getting there too. It looks great up there! I’m jealous of all the space you have to work with, and your great light! My daughter has a play room (which is a pretty big sacrifice in our 1000 sq. ft house), but she uses it more and more as she’s gotten older. It’s also nice to have a place where we can store all of her kid junk! I think the mannequins are moderately creepy, especially compare to the latex mask which is just over the top terrifying! What an ADORABLE space. The light is fantastic, but I love all the little areas and how it doesn’t feel like it is overwhelmed with toys. Impressive. 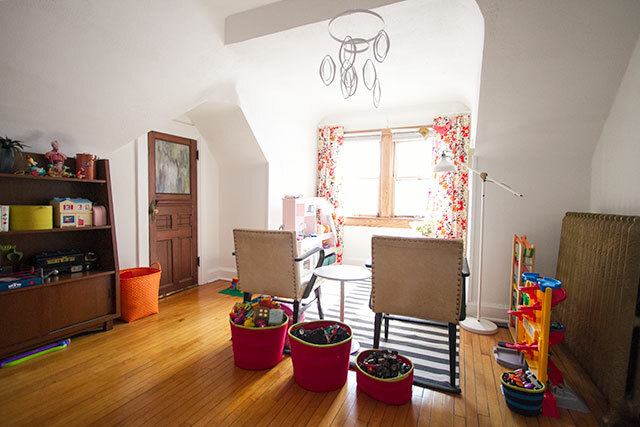 There are so many nooks and weird angles up in the attic, but it works really well for a playroom. That tiny closet really helps too. The striped rug seems to go perfectly in this room. 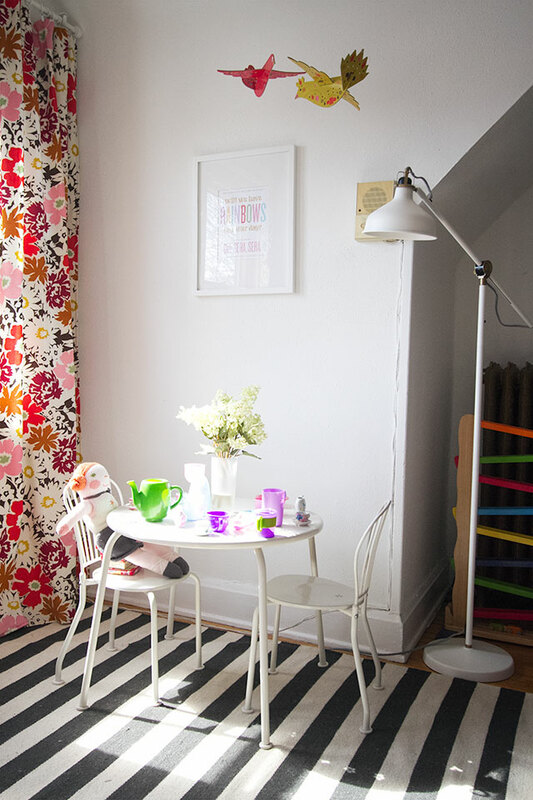 Bright and graphic but doesn’t compete with colorful toys and art supplies. What’s that intercom-looking thing on the wall, though? That would be an intercom. ;) It doesn’t work, and I think we’ll just remove it at some point. 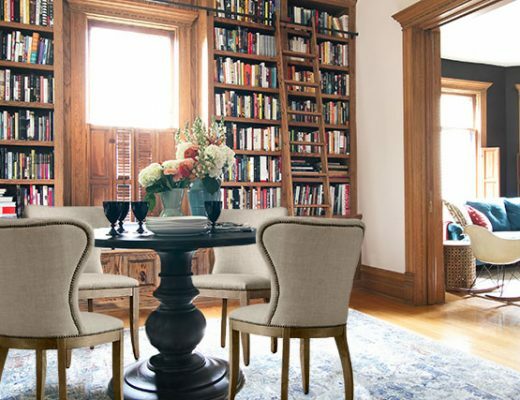 Oh, and that striped rug is the one that I ordered to go in August’s room for the last house. 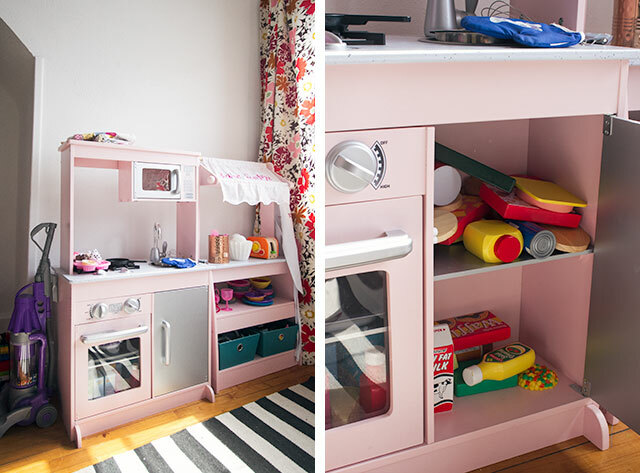 It’s perfect in the playroom here, and I like that it designates the play kitchen area from the rest of the room. I joke that it’s the kids’ little apartment. 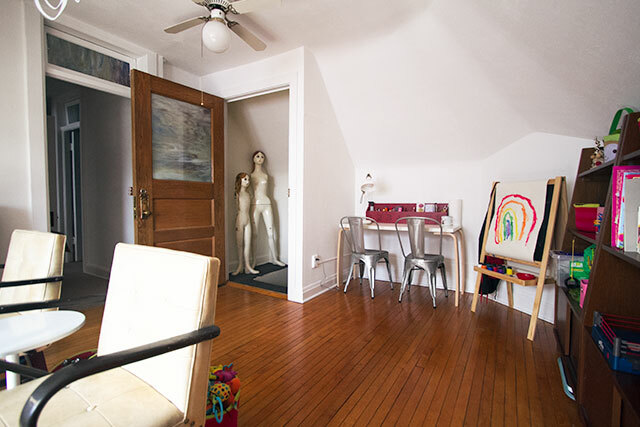 You should paint the mannequins with chalkboard paint – that might make them less creepy. awesome space! I really like the desk in the corner. Looks like you have a lot of natural light too, soo nice! What an adorable space! 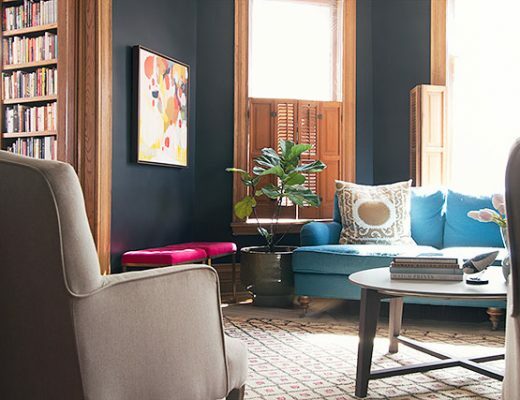 Absolutely loving the colorful curtains and that striped rug! You had me at “the latex head Brandon used to hide in our kitchen cabinets”. My Mom used to keep a very realistic rat in a drawer in her kitchen. It moved to every new house, and is still in my Dad’s kitchen drawer in the assisted living condo, even though my Mom is now, sadly, gone. Every time I open that drawer I gasp. OH MOM!!!! so funny…..
Ha! That’s funny. I love that your dad keeps it going. Can I ask where you found those nice lamps? 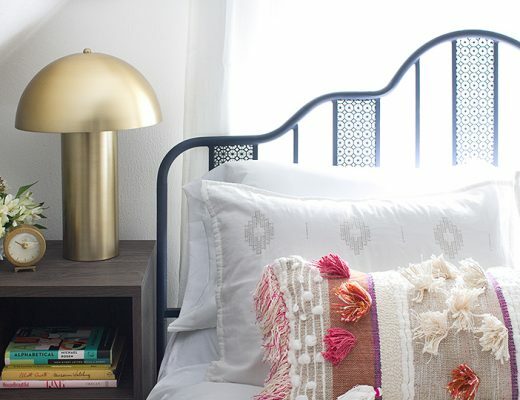 The floor lamp and table lamp look like a pair… I know I have seen them somewhere but can’t think of it! They’re both from IKEA — the Ranarp light. Where is the great little art desk from? Little man, who’s not so little any more, needs something similar for art projects. BTW- the mannequins are not nearly as creepy as that mask hiding in your kitchen! If they mention something about the ‘spider web’ still up from Halloween in (pick a month), I usually respond with ‘Oh no. That’s art. It stays up year round.’ They pass the friend test if they ‘get it’. Keep up the great work. Loving the new house. It seems to gave amazing light! Antique glove molds are excellent. I have a few modern reproductions, but your collection sounds perfect. 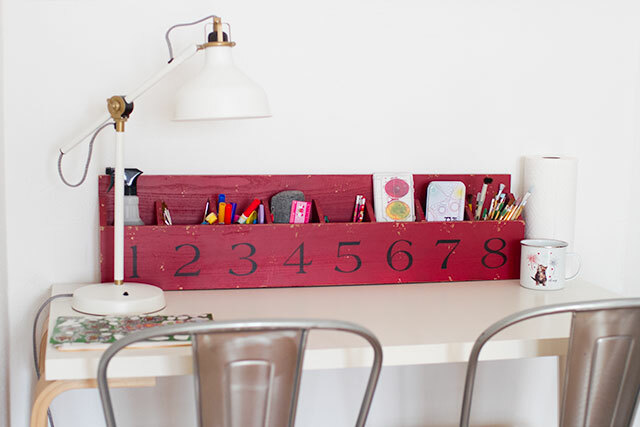 The desk is a 2’x4′ tabletop and legs from IKEA. They no longer sell the same legs, but they have lots to choose from. The mannequines… Are the kids creeped out by them? They really creep me out. Nope, we’re all used to them! I think the mannequins are cool. Maybe that makes me creepy, lol. Not sure if you answered this, but where is the white desk from? 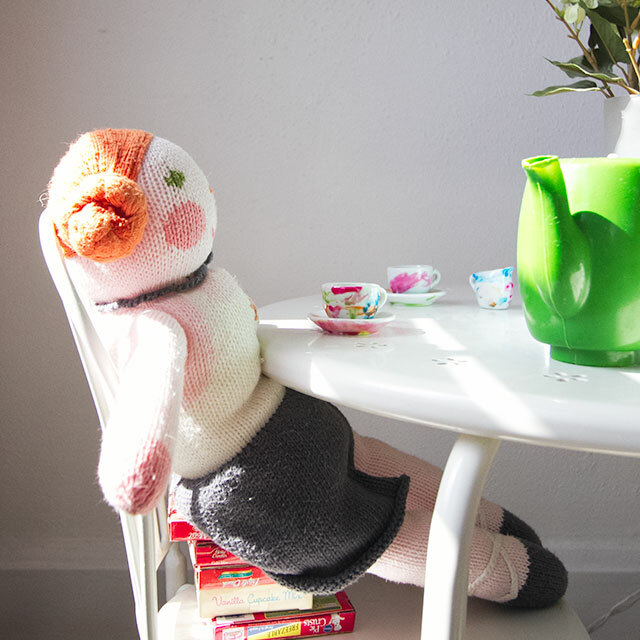 Am looking for a new one for my daughter who is outgrowing her little IKEA one. Thanks! Ours is from IKEA. I bought it for the National Stationery Show when I had a booth, because the top and legs were easy to ship from here to NYC and back in a crate. Ooo – nice! Such a great space. When I first saw the little clost/room with the stain glass, w/o thinking I assumed it would become a little kid library with books lining the walls and pillows on the floor. I think I was decorating it for me (and our one bookword offspring). 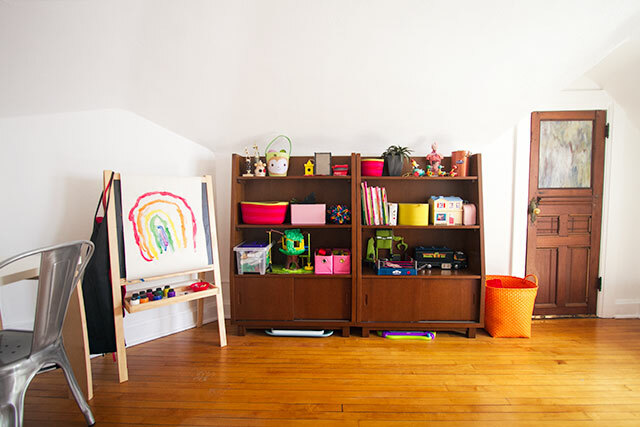 Can you share who makes that colorful wooden car ramp (in front of the radiator)? I’ve never seen a big one- my two-year old would love it! Does it work with Matchbox/Hot Wheels/little Tonka sized cars? Thanks! The playroom is such a lovely space! It’s such a great toy, but I’m not sure how to find another. It was a hand-me-down from one of Brandon’s sisters, with kids older than our own. It only works with the cars it came with though (the wheels are placed so that they’re double-sided and the cars flip over at each turn). Such a cute room! I love it! May I ask where the white cubby shelf came from? The one that houses the dress-up accessories? I think we may need one. It was a hand-me-down that someone else didn’t need anymore, so I’m not sure where it came from originally. I was wondering where you got the red organizer on the desk with the numbers on it. I love it and it would work perfectly for something I need here. Thanks! I picked it up on clearance last year, either at Pottery Barn or Pottery Barn Kids. I was just catching up on some blog reading and saw your post. I love the playroom! It is such cute space:) Our daughter’s “playroom” is part of our family room and we are struggling with finding a way to integrate it, but keep it separate (if that makes sense). I love what a sweet space you have made. Thanks for the inspiration!